The first half of the title of this post is a question I get, in some variation, quite frequently these days. You could change the subject to email or face to face networking or press releases, but the implication is always that some long established marketing tactic has been supplanted by Twitter or Facebook. My answer is always the same – nothing is dead – but the ways we use them have changed. My take is that if you establish a strong marketing strategy, one that helps you build trust, and you fully understand the behavior and objectives of your ideal customer, then you can use almost any tactic to build your business. In fact, some of the more “traditional” offline approaches have never been more effective when fused with technology and newer online approaches. Digital has changed the customer communication environment fundamentally over the years and caused many to forgo the traditional broadcast tools. But, smart marketers are discovering new ways to use old tools that are more in line with inbound marketing practices and are taking advantage of technology leaps to make a tactic like direct mail even more effective. I return once again, as I do often, to my definition of marketing – getting someone who has a need to know, like and trust you – if you can find a way to use a tactic to do that, than no tactic is dead or even out of bounds. Even the often maligned Twitter auto DM is fair game if you can find a way to use it to build trust – the fact is few can, but my point is there are no set rules or magic tactics in this game. 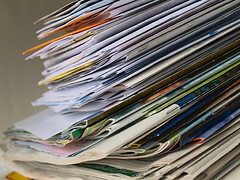 Use variable data printing on demand printing to create highly personalized direct mail pieces with unique images, stories and calls to action based on your customer database. The technology is there to do this in small batches with hundreds of variations. Use technology to produce postcards that invite each recipient to a personal landing page that features information tailored to their interests and alerts a sales team to initiate a further contact. Use traditional broadcast and print advertising to drive prospects to a series of free online videos that educate, entertain and inform – oh, and build know, like and trust. Reaching markets and creating buzz about our products and services still requires an integrated approach – that part won’t ever change, but before you drop a proven way to reach your prospects from the mix consider how you might use it build trust instead of move product.